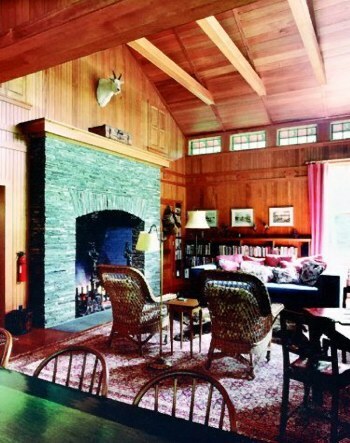 I've been learning from you since I designed my first Buckley/Rumford fireplace in 1991. That fireplace has never smoked and is loved by my clients. Others followed. In '96 I was lucky enough to build my own house and we used your specs and the Superior kit to build a 36 x 36 Rumford. I burn beautiful fires from Oct to April. I am now designing a new three level house (Boston area) with three Rumfords stacked in the same chimney: Basement level Library 48 x 48, 1st floor level Living Rm 36 x 36, 2nd Floor 24 x 24 (gas logs only, but will be usable for wood). Question: What to do about make-up air? I was thinking that the planned heat recovery ventilator system will provide the necessary air. (The heating system will be hot water to radiators.) Is this adequate? We plan to make the house tight with the best insulation possible. Thanks for your kind words about "our" Rumfords over the years. I agree with you that the recovery ventilator system is the right way to provide make-up air. Whether it's adequate or not - or even if it alleviates or contributes to the problem depends on it's capacity and whether it brings fresh air in or pumps more out. We recommend designing the ventilation system with the whole house in mind and striving to balance the system so that the indoor and outdoor air pressure are about the same. How much air you have to bring in depends on how tight the house is and how many appliances like kitchen and bathroom fans, fireplaces, clothes dryers, etc. you have and are likely to be running at the same time. Fireplaces need about one cubic foot per minute per square inch of flue area just to keep from smoking on tail out. They will take tow or three times that much air with a vigorous fire. So, at bare minimum your 48" Rumford will need about 250 cfm, the 36" Rumford about 150 cfm and the 24" Rumford about 100 cfm. PS: You have to tell me the story behind that blue Rumford on your website. I've always especially liked the cobalt blue glaze Superior Clay can add to clay chimney pots, firebrick or round chimney enclosures but whenever I recommend it people think I'm joking. I'll bet you would like it.